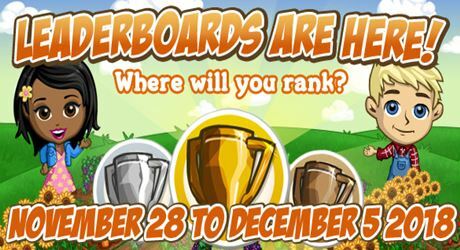 Here are the details for the next #FarmVille Leaderboards Challenge that will run from November 28 to December 5 2018. To participate, simply do the following tasks. There are 3 tasks that you can choose from or you have also the option to do all 3 tasks and win it’s corresponding reward. Harvest STARRY KNOT FLOWER to get to the top of the list! Harvest POISON BITE TENDRIL (CASTLE KAPUTSTONE) to get to the top of the list! Make SKULL LAMP at CRYPT REANIMATOR (CASTLE KAPUTSTONE). It will take 2 hours to make one and you will need Rice Crispy Pumpkin Bushel x3, Mummy Potato Bushel x3 and Plum Bats Bushel x2.